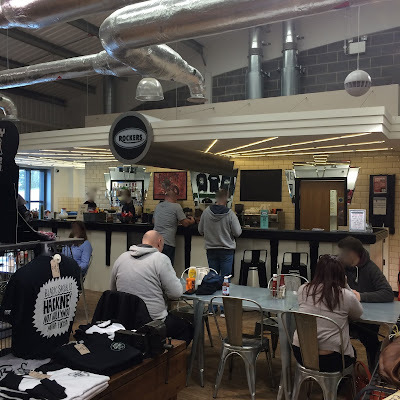 Rockers cafe can be found on the first floor of Krazy Horse in Bury St Edmunds. You can get all day breakfasts here every day except for Monday when they're closed. This really is a bikers heaven, the showroom downstairs has a vast selection of new and pre-owned bikes on display. At the top of the stairs you'll spot a juke box. In the far corner you will spot Rockers cafe. There are plenty of tables and even a pinball machine. We sat on the tables by the window. If you fancy something to read whilst you wait there's plenty of magazines available. The breakfast special seemed like a really good deal to me, my wife was delighted to see a vegetarian breakfast on the menu. Menus and condiments are already on the table, quality sauces are always a welcome sight. Free wifi is always a bonus, I got to upload my breakfast pic without using my own data. Decent sized mugs and branded milk jugs, nice! The breakfast was a good size and nicely presented. A decent pair of eggs. The beans were kept well away from the eggs here. Triple hash browns, black pudding and herby sausages. My wife's vegetarian breakfast, she swapped the eggs for extra tomatoes.